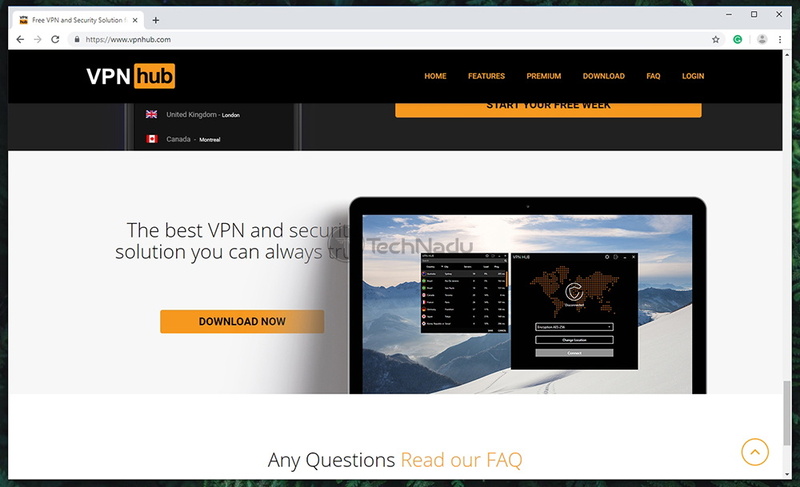 VPNhub Review 2019 – Despite Good Intentions, An Overly Limited VPN! VPNhub Review 2019 – Despite Good Intentions, An Overly Limited VPN! It wouldn’t be an understatement to say that today’s VPN marketplace is overcrowded. We see new options launching every week, making it hard to differentiate various brands. However, we believe that you’ll immediately recognize VPNhub, at least after taking a look at its logo. And yes, it is connected to the world’s most popular adult-oriented website. After knowing the difficulties of battling against censorship and being banned in numerous countries, creators of the recently-launched VPNhub now offer an innovative solution. If you check the official website of VPNhub, you’ll see numerous promises. 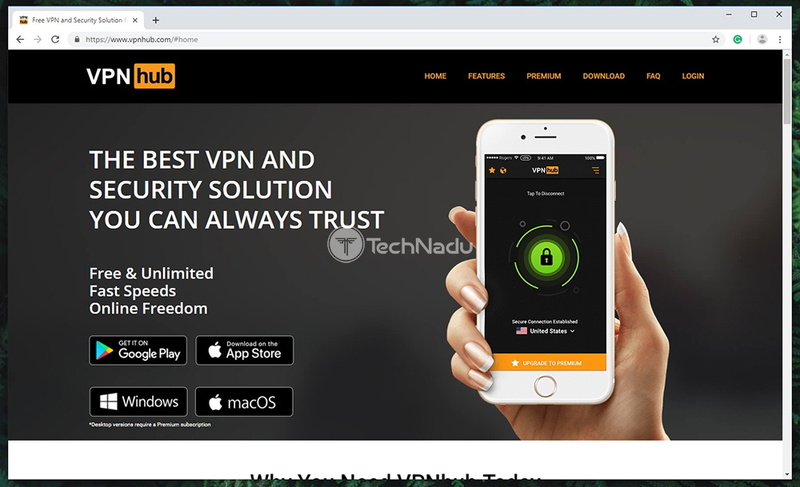 You’ll see messages that VPNhub is the ‘best VPN and security solution’ that lets you unblock websites, protect personal data, and use a range of free and premium plans. Of course, we know better than to trust those claims, and we’ll be testing this VPN in-depth. To introduce you to VPNhub, we have prepared three tables with the most prominent highlights. First, let’s check out some basic information about this VPN, found in the table below. The USA (5 Eyes Alliance). AES-256; OpenVPN (TCP/UDP), IKEv2, SOCKS5 proxy. Windows, MacOS, Android, and iOS. We understand that many of you need a VPN capable of unblocking media streaming services. Therefore, we’ve tested VPNhub with the most prominent websites and applications, and here are the results. And finally, we have one more table for those who are in a rush. In case you’d like just the highlights, here are the most prominent pros and cons of VPNhub, along with our final verdict. Easy to use; Unblocks Netflix; Reputable brand; No previous data leaks; Strong encryption. Incredibly small server network; Limited customer support; Limited platform compatibility; Collects anonymous data; Overpriced. VPNhub has a few things going for it – but we can hardly recommend this VPN. You can easily find much better VPN deals that are more affordable as well. And now, we’re ready to dive into our full review. As we’ve gone in-depth with VPNhub, there’s plenty to say. However, you’ll learn all there is to know about this VPN if you stick with us until the end of this review. Without any further ado, let’s begin. We try our best to test each VPN in-depth. To make sure we have valid comparative points, we put each VPN through a series of strictly defined tests. If you’d like to learn more about the way we review VPN services, please use the provided link where you’ll find our informative explanation. VPNhub comes from the USA – which is perhaps the most problematic country for any VPN-related business. It also comes free of any previous leaks, though. Our Score: 2/10. Before you get a subscription for any VPN, make sure to know where it comes from. This has numerous legal implications, so knowing that information is imperative. As you can expect, we’ve done our homework, and here’s what you need to know. As per this VPN’s legal documents, VPNhub is created by Appatomic Limited – founded and based in Cyprus. However, this seems to be just the ‘business’ part of this VPN service. Its actual servers are found in California. This means that your personal information will be processed by Appatomic in the United States, which is definitely a reason for concern. We understand that many think otherwise but the USA doesn’t have mandatory data retention law. However, there’s the Stored Communications Act from 1986 that allows the US government to obtain access to personal data. As you imagine, government agencies can easily force third-parties to collect and store your personal data if you’re under criminal investigation. Of course, we all know that the USA isn’t really willing to respect its own laws in terms of data collection. We know everything about Edward Snowden’s revelations, which were focused on the National Security Agency (NSA), US surveillance programs, and US Intelligence Community partners abroad. This also leads us to another important topic – the USA is a member country of the 5-Eyes Alliance. This is a group of countries aggressively collecting different types of data, endangering the privacy of their own citizens under the disguise of protecting them. With all of this said, we wonder why has VPNhub allowed itself to be connected to the USA? We’re not sure about that, but we know one thing – you’ll hardly find any information relating to VPNhub’s connections with the USA on its official website. Those who don’t do their research can easily think that VPNhub is based in a country with strong data protection laws. 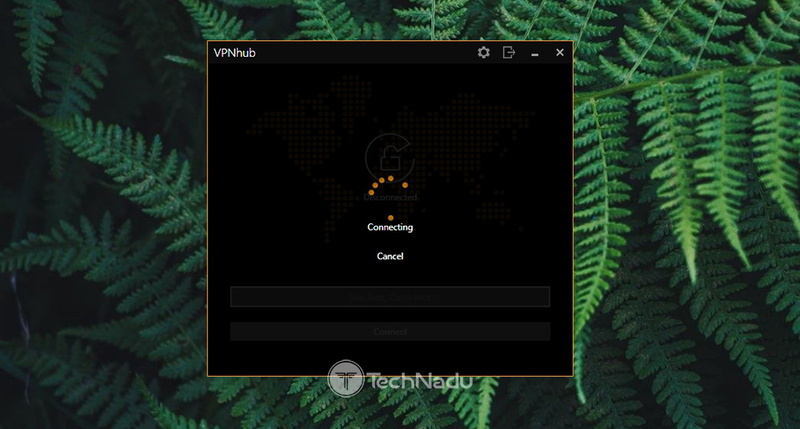 VPNhub is a relatively new VPN service, being available for around one year now. This isn’t enough time for any VPN to prove its worth even though plenty could be done in one year’s time. Well, you’ll be happy to know that VPNhub comes free of any data leaks in the past. With everything said so far, we can see that VPNhub has two faces. First, it does look like a reliable and user-friendly VPN that avoids collecting any type of data. However, our perception changed once we started to dig underneath the surface. Being based in the USA, we find it very hard to trust this VPN and to recommend it to anyone looking for a reliable way to protect their privacy. VPNhub is compatible with only four platforms. And since it can’t be configured manually, you can’t install this VPN on routers or media streamers. Our Score: 3/10. Since you’re paying for a VPN subscription, you must make sure that all your devices are protected. This means having native VPN apps across the board and plenty of simultaneous connections. Let’s see how well does VPNhub respond to these criteria. As you can see from the table above, VPNhub supports only four platforms. When it comes to computers, you can use it on Windows and MacOS. And when it comes to mobile platforms, you can install VPNhub on Android and iOS. And that’s pretty much it. We were surprised to see that VPNhub isn’t available on routers, especially since it’s based on the OpenVPN protocol (compatible with a wide range of routers). In other words, you can’t configure this VPN manually, which also means that you can’t use it on devices not supported by official apps. So, we’re talking about Linux, Android TV, FireOS, or any other platform that’s not on the VPNhub’s list. In addition, you get three simultaneous connections. In general, VPNs offer around 5 connections for each subscription. However, considering its limited compatibility with devices and platforms, we think you’ll hardly have a need for additional connections. Downloading and installing VPNhub is a piece of cake. However, you’ll need to input your payment information even before getting access to its trial. Our Score: 7/10. To get started with this VPN, you first need to sign-up for VPNhub. You should know that you’ll be getting a 7-day free trial, but you need to finalize the sign-up process first. This includes choosing a subscription, entering your email address and password, and filling out your payment information. Then, you can download this VPN on your device. The process of installation is simple enough. If you’re a Windows user, you’ll need to download a 16MB installation file, which tells us that VPNhub is lightweight enough. Then, double-click on the installer, choose where to install the required files, and that’s about it. After a few moments, you’ll see the log-in screen of the VPN, where you need to enter your username and password. No matter if you use Windows, MacOS, Android, or iOS – the process of installation doesn’t stray away from what you’re accustomed to. There’s no bundled software or any other annoying offers. All in all, you can get started with VPNhub in a matter of minutes. 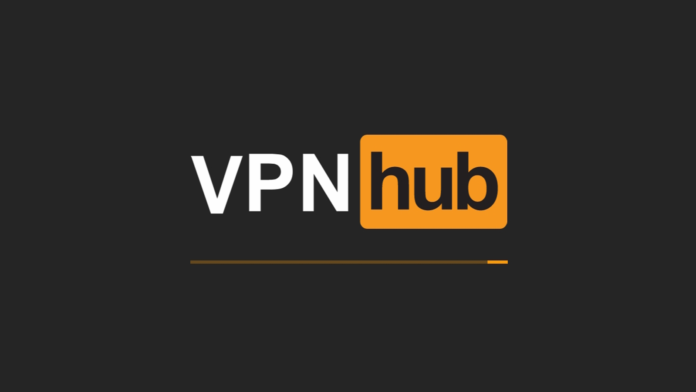 VPNhub is an average VPN service designed for average home users. This means that more skilled individuals will be left wanting for more. Our Score: 7/10. Every VPN offers a set of features comprised of basic and advanced ones. So, even before we start testing this VPN, we want to know what kinds of features it promises to bring. Take a look at the following table. To make sure your private data stays within the secure tunnel, VPNhub brings a DNS and IPv6 leak protection. Then, there’s a built-in kill switch, which shuts down your entire Web connection in case you get disconnected from a secure server. The best thing is that you can enable/disable all of these options, one by one, which gives you complete control over your privacy. When it comes to more advanced features, you won’t find them here. For example, split-tunneling isn’t on offer, nor any kind of ad-blocking or anti-malware. Luckily, you get to use this VPN with no limitations in terms of server switches, bandwidth, or data. 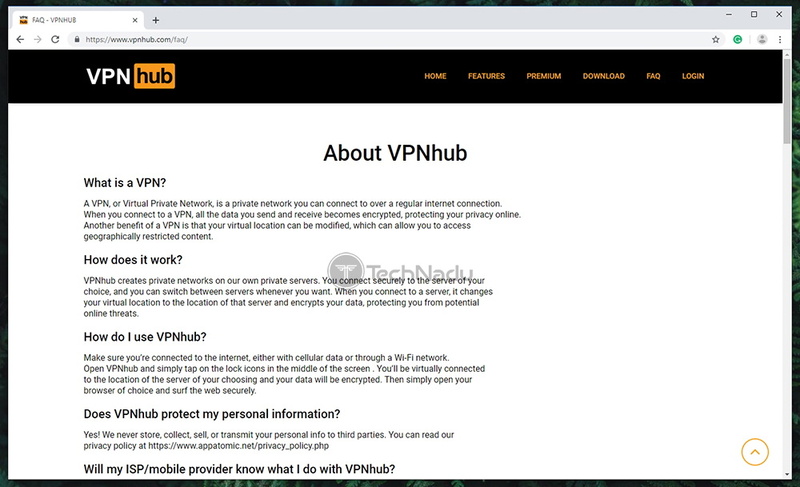 We can conclude this segment by saying that VPNhub is an average VPN service. It covers the basic features in a good way. However, it falls short when it comes to more advanced and innovative options. With this said, we think it’s designed for average VPN users. Sadly, VPNhub comes with only 70+ servers. However, you get access to 49 countries, plenty of locations to choose from, and unlimited switching. Our Score: 3/10. When it comes to using VPNs, you want to have plenty of both nearby and remote locations. You use nearby locations when you want the best possible performance, while remote locations allow you to unblock specific websites and get foreign IP addresses. As you can see, VPNhub currently offers 70+ servers. We have to say that there is polarizing information on the Web about this VPN’s server count, with some sources claiming that VPNhub has more than 800 servers. However, we’ve tested the application on our own and also talked to the company’s representatives – and we conclude that it has 74 servers right now, in 74 different locations. When it comes to its sheer server count, this is one of the ‘smallest’ VPNs out there. Since its competitors have from 3,000 up to 5,000 servers, this is one of the weaker sides of VPNhub. However, it’s not all bad as you get access to 49 countries, which is admirable. 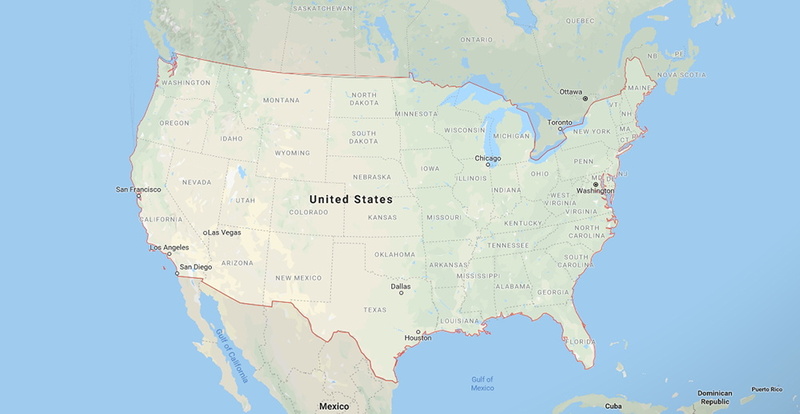 We also need to mention that you can connect to individual cities across a large number of countries, which allows you to access regional websites. And you also get unlimited switching, with no restrictions. All in all, VPNhub has done a good job of offering various locations in numerous countries. However, the biggest limitation is the low number of servers which puts VPNhub in the group with VPNs with a highly limited server count. VPNhub comes with a fully functional interface. However, it feels somewhat outdated and we wished to see it more simplified. Our Score: 6/10. Today’s VPNs are incredibly intuitive applications with highly polished UIs. This means that you can expect to find a VPN that’s intuitive enough for complete beginners while offering plenty of flexibility for more advanced users. Now, we’ll check how VPNhub looks like, and whether it’s easy to use. The home screen of VPNhub comes with a simple UI. There are two buttons, for selecting a server and for establishing a secure connection. The first time you open the application, you need to click on the ‘Change Location’ button, and then you’ll see a list of servers. There are three ways to filter the available servers. You can choose to list them by their country of origin, location, or load. Luckily, there’s also an option to search for a specific server. Once you find something interesting, double-click on it and you’ll be returned to the home screen. To initialize the connection, you need to click on the prominent ‘Connect’ button at the bottom of the UI. We’re sure you’ll want to take full advantage of this VPN. With this said, we recommend you visit the application’s setting panel, found behind the cogwheel icon in the top-right corner. You’ll find five tabs here, and we’ll explain what to expect from each of those. 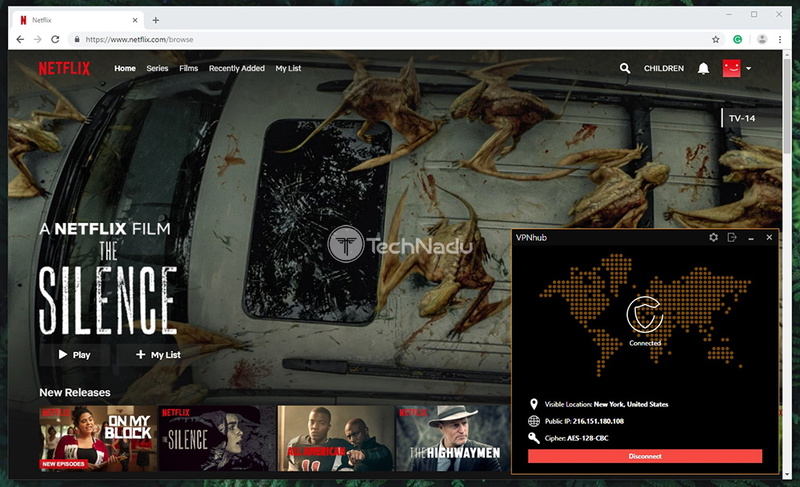 General: The first tab lets you set VPNhub to launch upon system startup, and you can also connect to the last used server. Then, you can enable/disable the VPN’s kill-switch and choose whether to automatically reconnect if the VPN tunnel gets disconnected. Connection: The Connection tab lets you pick a VPN protocol. 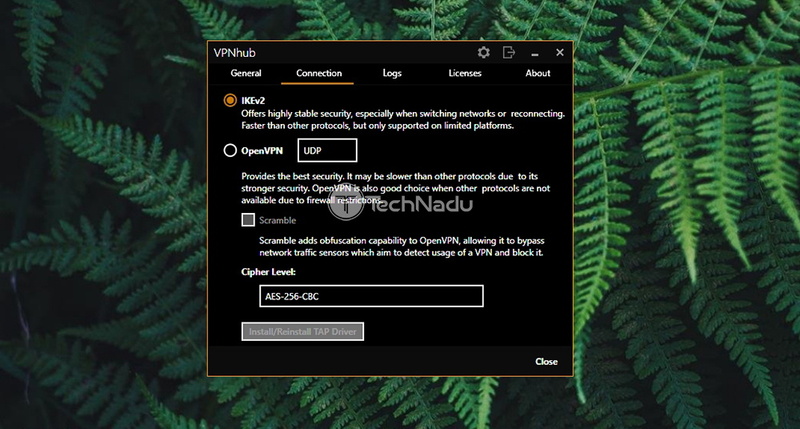 We’ve tested VPNhub on a Windows 10 PC, where we got to choose from IKEv2 and OpenVPN (TCP/UDP). You can also choose from two encryption levels: AES-128-CBC and AES-256-CBC. Logs: In case you experience any issues with this VPN, you’ll be asked to supply a log data – which can be found here. This is a text-based document describing how the application behaves, so support technicians can pinpoint the exact cause of your problem. 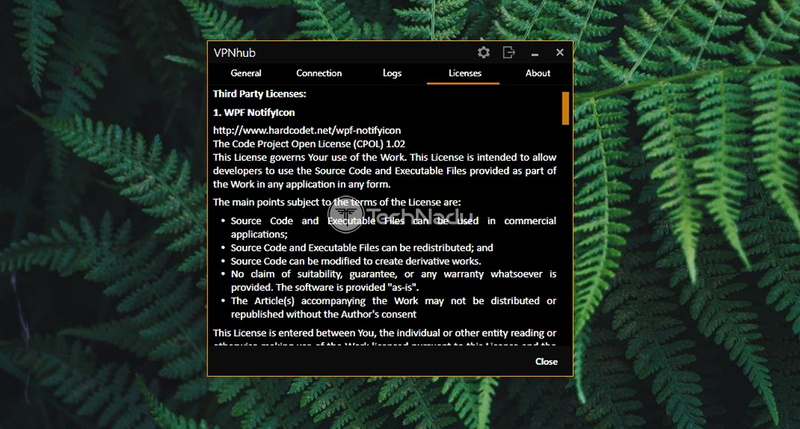 Licenses: This tab lets you review licenses of third-party software that VPNhub uses. In other words, this is a legal document that doesn’t concern regular VPN users. About: Finally, the About tab lets you check which version of the VPN software you have installed. Sadly, you can’t update the application from here, which seems like a missed opportunity. All in all, VPNhub comes with a simple interface. However, we can’t say that it’s highly polished. It feels outdated in certain aspects and some things are missing. For example, there’s no easy way to update the application itself or to review your account information (so you can know when your subscription is due to expire). In other words, it’s usable enough, but it’s not the best example of a user-friendly UI. 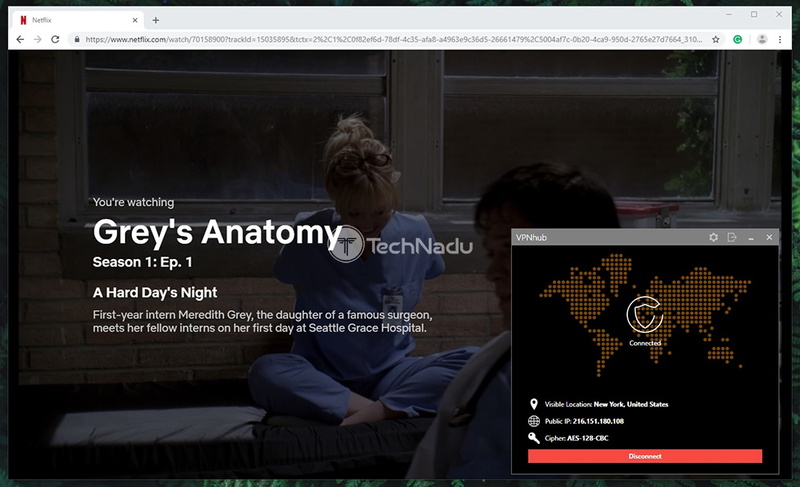 VPNhub can help you access the US version of Netflix, and you can also download torrent files. Other streaming services are not supported. Our Score: 4/10. We’re sure that many of you want to know if VPNhub can unblock websites such as Netflix and Hulu. Well, we’ve done a series of tests and here are our findings. As per our tests, we managed to access the American version of Netflix. Not all of VPNhub’s US servers work for this purpose, but you’ll manage to find a few working ones. Sadly, we didn’t have the same luck with BBC iPlayer, Hulu, and Amazon Prime Video. While BBC iPlayer and Hulu detected the presence of a VPN and quickly blocked our access, Amazon Prime Video was stuck at loading the website. When it comes to torrenting, VPNhub supports this kind of Web traffic. There’s even a SOCKS5 proxy that you can use for this purpose. However, as we always recommend, you must stick to legal files only. This means avoiding copyrighted files as downloading this type of data is deemed illegal in the majority of countries. VPNhub utilizing strong VPN protocols and tough encryption. It has no DNS leaks, but it does collect some anonymized data about its users. Our Score: 8/10. Let’s not forget that the primary purpose of any VPN is to keep you safe online. This means that you must pay special attention to its encryption and VPN protocols. To help you figure out whether VPNhub is the right choice for you, keep on reading this review. At the moment, VPNhub offers 128-AES-CBC and 256-AES-CBC encryption. The latter one is considered to be the industry standard, as it’s practically uncrackable. And let’s not forget that VPNhub offers two protocols to choose from – IKEv2 and OpenVPN. You’ll get only one or both of these, depending on your platform of choice. However, both IKEv2 and OpenVPN are considered to be incredibly secure without sacrificing performance. Immediately after you launch VPNhub, a group of information will be collected. This includes your device’s unique mobile ID, operating system and platform, Web browser type and version, network information, and more. Then, after you connect to a secure server, your IP will be collected (which is anonymized, apparently) along with ‘usage data’. This includes non-personally identifiable information about the way you use VPNhub and its website. Just like the majority of VPNs, VPNhub does collect plenty of data. However, you can only hope that all of that data is anonymous. Still, there’s no reason to think otherwise, at least at the moment. As you can see from the screenshot above, VPNhub comes free of any DNS-related leaks. This means that it doesn’t actively leak any of your data. Instead, third-parties will only be able to see what VPNhub shows them and that’s your virtual IP address, virtual hostname and ISP, and your virtual location as well. VPNhub slowed us down by 26%, which is well above the average result. We especially liked the fast performance of its nearby server. Our Score: 8/10. Even the most attractive features don’t mean much if you’re facing slow Web speeds. To give you an idea of what to expect from VPNhub, we’ve done a round of speed tests. So, here’s what you need to know. First, we need to establish baseline data by checking the speed of our Web connection. During this step, we leave VPNhub disabled as we want to see the speed of our ‘naked’ connection. As you can see from the screenshot above, we received 148.02 Mbps for downloads and 9.60 Mbps for uploads. The performance of a nearby VPNhub server. Next, we want to check how a nearby server performs. We’re located in Europe and we’ve found that VPNhub has a single server in our country. After connecting to that server, we managed to get 126.23 Mbps for downloads and 9.22 Mbps for uploads. All in all, not a bad result. The performance of a remote VPNhub server. Finally, let’s check the speed of a remote server, found in the USA. In general, this country is a popular destination among VPN users, so we generally expected a slower performance. And as you can see, we got 92.66 Mbps for downloads and 3.81 Mbps for uploads. We’ll now place all those numbers in a table below, so take a look. We conclude this segment by saying that VPNhub has made our Web connection slower by 26% on average. This is well above the average result and we were generally happy with this VPN’s performance. VPNhub is ready to help when needed, but you can only count on checking the FAQ section or contacting the company via email. Our Score: 3/10. VPNs are powered by different types of complex systems and something can go wrong from time to time. That’s why it’s imperative to have a reliable support team, ready to respond to your questions at any moment. Here’s how VPNhub ranks in that aspect. FAQ: This VPN comes with a series of frequently asked questions that are answered in a simple way. The FAQ section on the official website seems to be created for complete beginners, who are facing a VPN application for the first time. Email Support / Tickets: In case you have any further questions, there’s an email address you can use to contact this company. In our case, it took around 10 hours to receive a response. However, you can expect plenty of follow-up questions until your problem gets resolved. This means that if problems arise, you might be unable to use VPNhub for a few days. We have to say that we were rather disappointed with VPNhub’s support mechanism. There’s no live-chat and the company’s self-help resources are fairly limited. VPNhub is one of the most expensive VPNs out there. And surprisingly enough, it doesn’t offer any money-back guarantees. Our Score: 1/10. VPNhub comes with two subscription plans. What you need to keep in mind is that you’ll get a 7-day free trial if you choose the VPN’s monthly plan, which gives you plenty of time to test it out. Let’s take a look at how much you’ll need to pay to register with this VPN service. Being priced at $13.99 per month, this is one of the most expensive VPNs we’ve covered yet. As you know by now, we think of VPNhub as an average VPN in terms of its features and capabilities. In other words, it’s definitely overpriced. The situation somewhat changes if you’re willing to invest in this VPN’s long-term plan. You can subscribe to VPNhub for $6.99 per month by deciding to pay annually. This means that you’ll need to pay $83.88 every year, which is still more expensive than what other VPNs offer. We also need to highlight the fact that there are no money-back guarantees. This means that if you pay for a subscription, you can cancel it anytime. However, it’ll be hard to convince VPNhub to return your money. To be fully honest, it’s hard to recommend VPNhub. It’s perfectly suitable for average home users who want everything to be automated. However, what prevents us from recommending it is its high price. We think that you’ll easily find a much better deal out there. PROS: Trustworthy brand; Doesn’t track your online activities; Doesn’t leak data; Above-average performance. CONS: Small server network; Collects anonymized data; Limited customer support; Missing advanced features; Overpriced. OUR SCORE: 4.7 out of 10! In case you’d like to explore more, make sure to visit the official website of VPNhub. And if you want to check out other options, we have an article on the best VPNs today – so make sure to give it a look. In case you liked this review, we’d like to ask you to share it on the Web. And to stay on top of the latest VPN-related coverage, don’t forget to follow us on Facebook and Twitter. 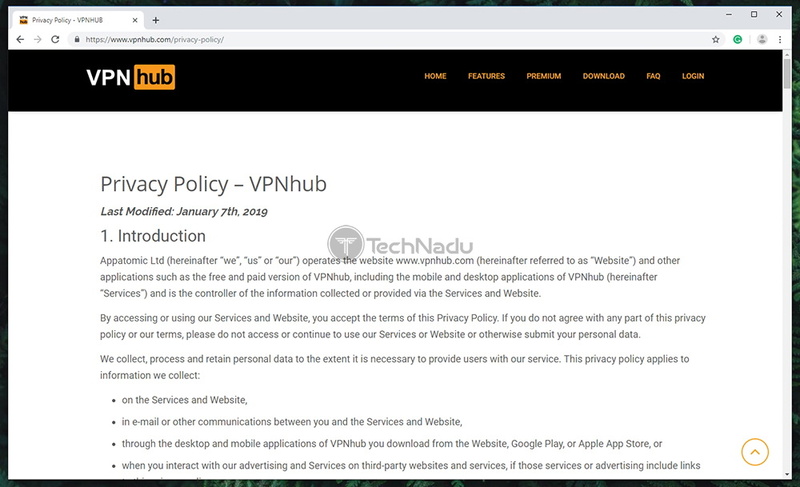 Despite its good intentions, VPNhub comes with serious limitations that prevent us from recommending it to our readers. 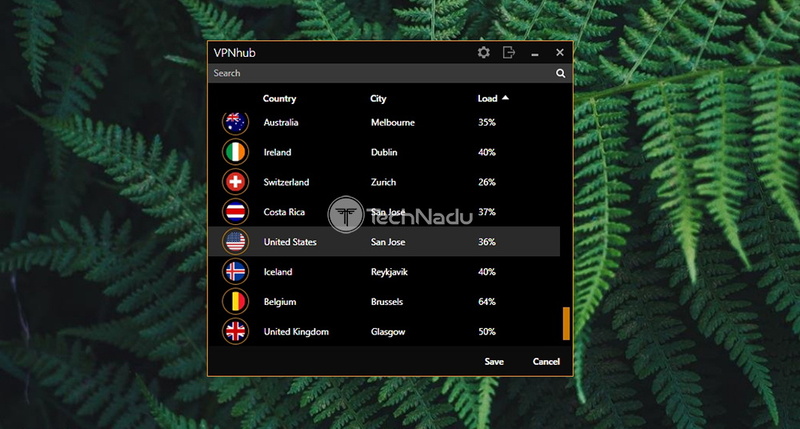 We believe that you can easily find more capable VPN alternatives that cost less - which certainly doesn't put VPNhub in a good spot.